We practice all methods of fishing including trolling, live baiting, fly fishing, jigging, popping and bottom fishing. We provide all the fishing tackle that is required for our target species. Just let us know your preference and we will be pleased to make the arrangements. 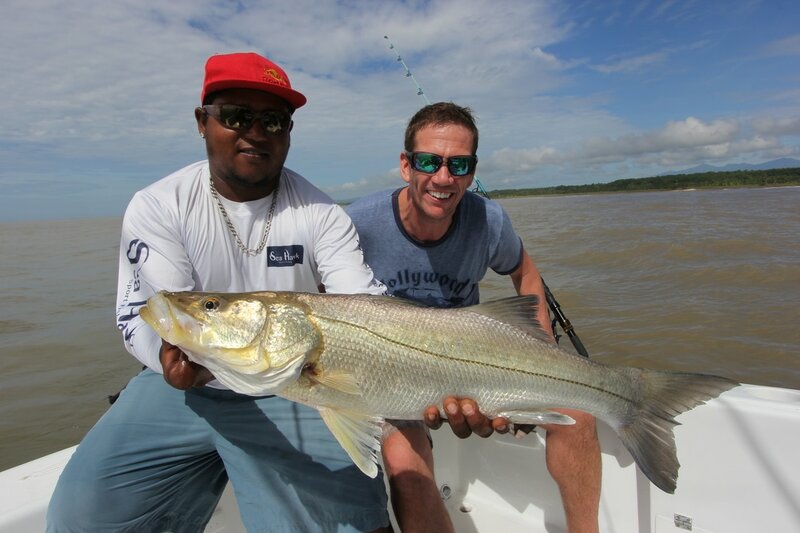 ​*Multi-day fishing adventures also available. For more details check our 'Packages' page or simply contact us. Our offshore fishing grounds are typically between 18-40 miles off Quepos and depending on where the fish are biting we usually spend about an hour cruising to the fishing grounds. Have your camera at the ready as we regularly encounter an abundance of Marine Life including Birds, Dolphins, Turtles, Whales, Manta Rays, Tuna, Flying Fish and for those with a keen eye, free jumping Sailfish & Marlin. 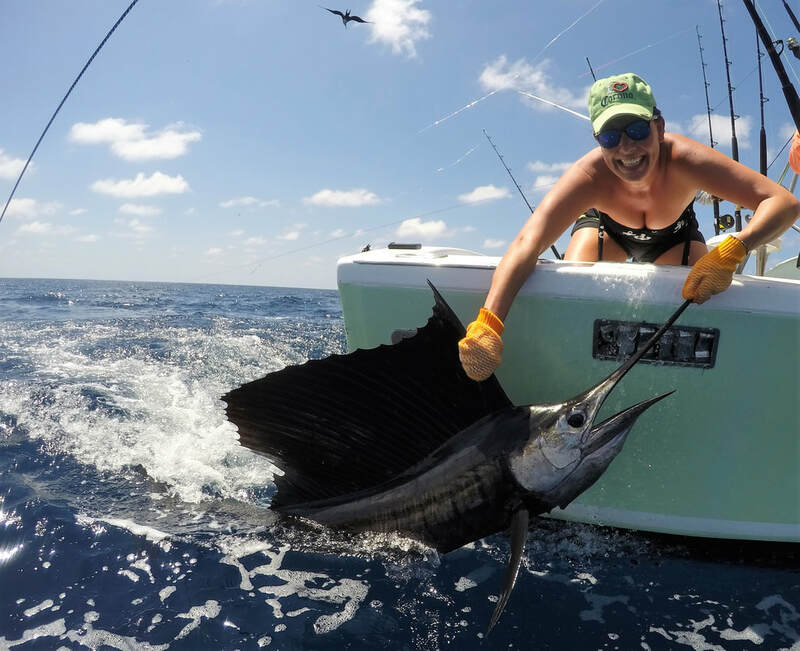 The primary fishing method for Sailfish in Costa Rica is trolling with Ballyhoo’s whilst running teasers & dredges from the outriggers to help attract the Sailfish. This method is very exciting and visual as you get to see the fish lit up behind the boat chasing the teasers before they take the bait. It is not uncommon to have 3 or 4 fish in the spread at the same time so things can get pretty hectic! Sailfish catches of 10 to 20 in a day are not uncommon in peak season. Blue, Black & Striped Marlin can all be caught off Quepos. The average Blue & Black Marlin are in the 200-300lb range, however, every season there are some really big fish caught, with numerous Marlin over 500lbs. We normally have two 'Hawaiians', a Bait/Lure combo on 50lb class tackle in our spread so that we are always ready should a Marlin appear. Over our Offshore Reefs or when we find some floating debris, we often fish live Bonito for Marlin which is another excellent technique, especially for large Blacks. 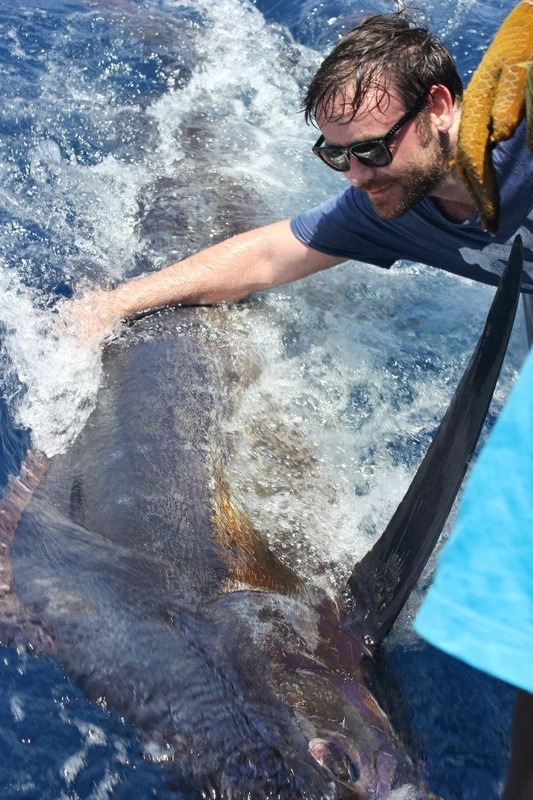 One of the largest fish ever caught on rod & line in Costa Rica was a 1,245lb 'Grander' Black Marlin caught with Capt. Manuel Gabuardi aboard our boat ‘GOOD DAY' in August 2008. Capt. Manuel will not forget that day in a hurry! More recently, on February 8th 2017, we had another epic day aboard GOOD DAY when we released a Marlin estimated at 800lbs. Read more & check our fishing packages here! Yellowfin tuna up to 200lb are commonly caught off Quepos. They are typically found together with huge schools of spinner dolphins, so once we find the dolphins we know that the tuna are not far away. 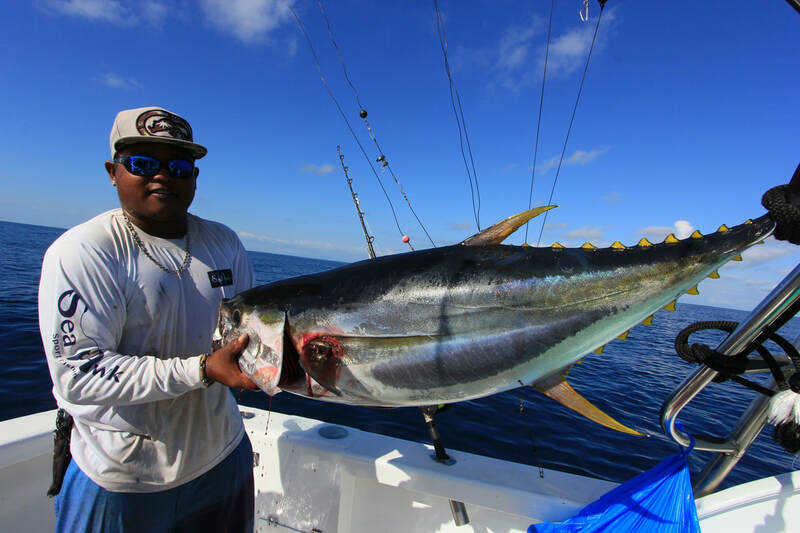 Some days they can prove difficult to catch but once they are biting it is not uncommon to catch 5 to 10 Tuna in the 20-100lb range with the chance of a very big arm wrenching 200lb-300lb fish always a possibility. ​Read more & check our fishing packages here! 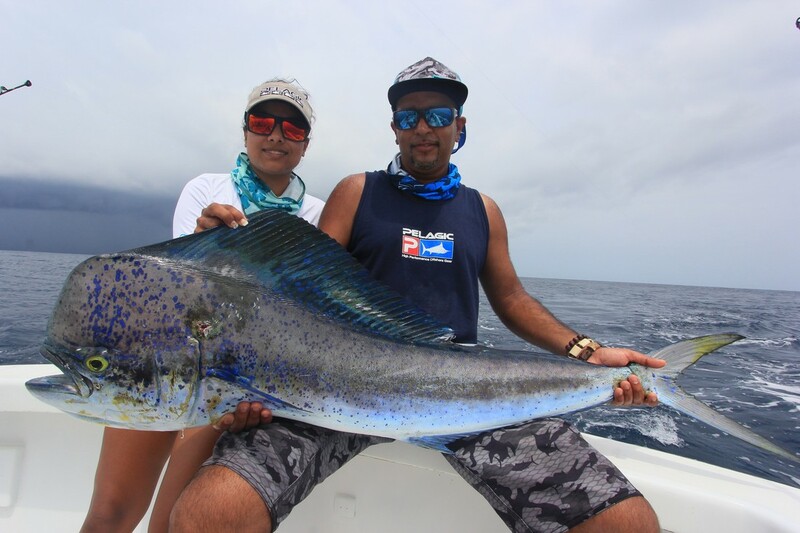 Mahi are caught all year round, however, are most prolific during the rainy season which peaks in September & October. With the rivers in flood there are lots of trees and debris being washed out of the river mouths which ultimately create weed lines offshore which the Mahi love to congregate under. This style of fishing can be great fun, especially on the fly or using light tackle. It can be common to catch multiple fish under a single piece of floating wood and be sure to have your polarized lenses as you can see everything happening right before eyes! ​Roosterfish love rocky outcrops, islands and surf lines. They can often be found chasing the sardine shoals where the pelicans can be seen diving. Live baiting is the most popular method and our typical baits are Lookdowns, Blue Runners or Sardines which we fish either close to rocky outcrops or near the bait shoals. 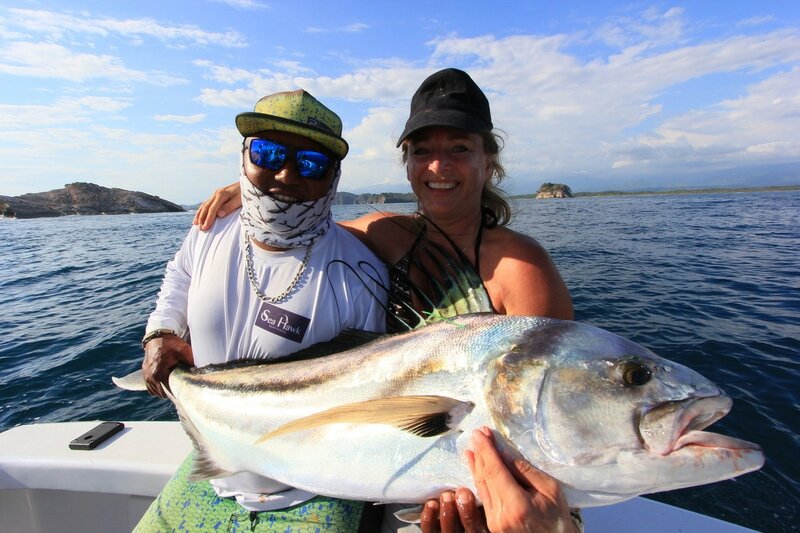 ​To target a really big fish it is also possible to fish a live Bonito close to rocky outcrops. If something takes this bait, hold on for the ride as you know it is going to be big! 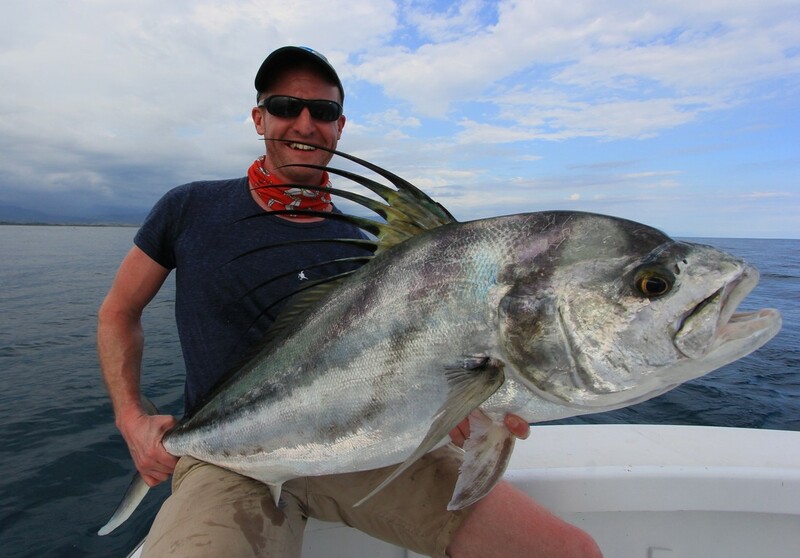 Roosterfish of 20-50lb are common with 80-100lb fish showing every year too! ​Read more & check our fishing package here! The IGFA world record Snook of 59lbs was caught just outside the Naranjo Rivermouth, a short cruise from the Marina Pez Vela in Quepos. Within easy access of the Marina we have several other world class Snook hotspots such as Parrita and the Baru rivermouth at Dominical. Snook fishing can be done from the Beach/Rivermouth or from the Boat fished close to the beach. We typically fish live baits, but lure and fly is an excellent way to catch Snook for the adventurous angler.